Open the Door, a project I co-created for Playing Out, will be at some of the upcoming Make Sunday Special 2015 events in Bristol. Jenny Sanderson, Sarah Corbet, Ellie Freeman and I will be on hand, to bring wishes and visions for people’s own streets to life, through improvisation, cardboard, marker and chalk. 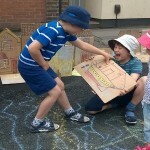 Part performance-part play scape-part art installation, this is a lively and fun opportunity to imagine playful ways to reclaim your own street. see here for further details. Or here.